A number of friends and coworkers along with a few people who read my blog have asked for help in starting a blog. Most questions centered around what blogging platform and hosting company to use. I used to tell most of these people to take a look at Blogger and Windows Live Spaces. If they were geeks, I’d tell them to roll their own blog and install WordPress on their own domain. But I was hesitant to suggest that to everyone because I knew I’d be called on to provide tech support when they got stuck. But over the past couple years or so it’s become easier for the less technically inclined to use WordPress. I’ll get into the reasons for this later, but if you’re reasonably comfortable using an FTP program you’ll have no problems getting up and running with WordPress. The installation and administration of is handled by a slick, easy to use web-based interface. Really, there’s nothing to be afraid of. WordPress is a fantastic blogging platform for many reasons but a few of my favorites include it’s stability, ease of use and plugin and theme architecture. With plugins and themes, it’s easy to change the look of your blog and give it additional functionality without having to know how to program. So here are the steps to getting up and running with WordPress. This assumes you want to run WordPress on an existing domain or register your own. This is the most important decision you’ll make. A bad host will lead to lots of downtown and poor service and support while a good host will make the experience go smoothly. I’ve run WordPress on six different hosts and I can only recommend two of them: Pair and Bluehost. (Note: If you find this article helpful, you can help support me by signing up with Bluehost through the links found here. If you don’t that’s cool too) Both Pair and Bluehost are top notch hosting companies with excellent support and products. As with many services, you get what you pay for. You’ll find cheaper hosting companies but you won’t care that you saved two bucks a month when you’re blog is frequently down. I’m sure there are other good hosting companies, but I’m only going to recommend the two I’ve used for years and that I know you’ll be happy with. Having said that, Bluehost is the best hosting company I’ve used hands down. They are an excellent choice for the noob as well as the web savvy veteran. I’m currently hosting four WordPress blogs from one account and was able to setup each with a single click using a cool feature called Fantastico. I don’t know if Pair uses this but I assume it does or something similar. If you want to install WordPress into the root of your domain so your site is accessible at www.yourdomain.com then select your domain from the Install on domain drop down list. If you want to install WordPress on a subdomain such as I’ve done (blog.nordquist.org) you’ll need to go back the Control Panel page and setup a subdomain under the Domains areas. Most people want their blog accessible off the root domain. Under the Admin Access Data area create a username and password and write it down. If you don’t have this, you won’t be able to login to your blog. Again, make sure you write this down! Under the Base Configuration area do the same. I just use admin as the username and a password I can remember. You don’t have to fill out the Email Account Configuration area at this time. But if you know this information it doesn’t hurt to fill it out now. Once you have this form filled out, click on the Install WordPress button at the bottom of the page. Fantastico will tell you if WordPress was installed correctly. If it does then you’re ready to login for the first time. This is the moment of truth. You will fire up your browser and go to http://yourdomain/wp-login.php where you’ll see the graphic below. If you don’t see this graphic it means WordPress was not install properly. Before I post anything I like to check to make sure WordPress has all my current information. Do this by clicking on Settings off to the far right and check to make sure everything looks OK under the General Settings area. Give your blog a Title and Tagline if you’d like. When you’re done, click on Save Changes at the bottom. Now look over to the far right and click on Users. This is where you’ll setup accounts for those who will be posting articles on your blog. Since I’m the only person who does that on my blog, I setup an account for Brett Nordquist. You’ll need to remember the username and password for this account as well. If you want to login as this new users you’ll need to logout first using the link in the upper right corner. I suggest looking around the rest of the admin area. Once you’re ready to post you can do so by clicking the Write link in the admin or use a product like Windows Live Writer that acts like a word processor that posts to WordPress. Easily one of the coolest features of WordPress is the way you can easily change the look of your site by installing themes. There are thousands of available themes you can install for free. You can also add additional features to your blog by installing plugins. An example of a plugin on my blog is one that pulls pictures from Flickr and displays them in the sidebar. Most plugins and themes are free to use. Check out this post and this post for a few of my favorite theme collections. My only suggestion when it comes to themes is to keep it simple. The best themes I’ve used are the ones that don’t try to do too much. Try a single column theme instead of one with three or four columns if you’re just starting out as it will make editing the theme a lot easier. I don’t spend a lot of time searching for plugins but I do run a few that add features to my blog that I find helpful. A few of my favorites are Flickr Badge, Google Sitemap, SRG Clean Archives, and Post Views. Once you’ve found a few themes or plugins you’d like to try, you’ll need a way of getting those files onto your server. There are a number of ways to do this but I’ve found that using an FTP client is the most reliable way to do this. Mosey on over to this page and grab the best FTP client around. It’s called FileZilla and it’s free to boot! Look for the directory named wp-content and double click on it. Any new plugins you’ll need to upload into the plugins directory. Any new themes should be uploaded to the themes directory. Makes sure you read any instructions that came with the plugins and themes. I suggest keeping your plugins to a minimum for a while but testing a number of themes until you find one that suits your fancy. Switching between themes it done in the admin area of your blog under the Design section. Once you see a preview of a new theme you’d like to try, just click on the picture and it’s done. Any plugins you upload will need to be activated by going to the Plugin area. Once activated your plugins are ready to go. Well, those are the basic steps to get up and running with WordPress. If you have questions or suggestion feel free to use the comment section. What other suggestions would you have for those looking at using WordPress for the first time? I’m interested to hear what other reliable hosting companies you’ve found. Nicely done. I have this saved so I can send folks to read it who are contemplating the idea. 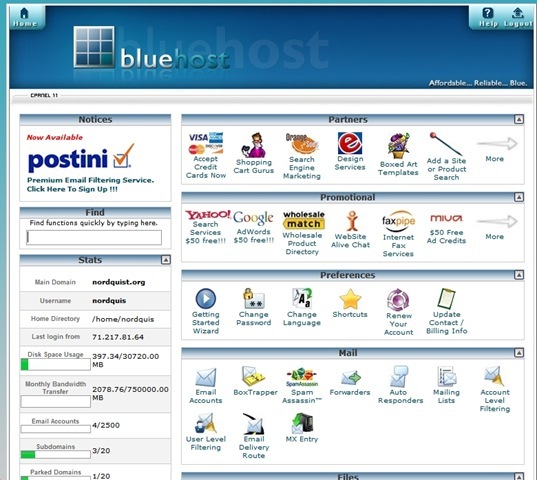 I use Bluehost. My big complaint is they are slow to offer upgrades via Fantastico. I’ve kvetched to WordPress that if Bluehost is a preferred provider, you would think they would be on top of the upgrades. GoingLikeSixty, I agree with you about the Fantastico updates as it does take some time for the latest versions to show up. I wonder if one of the ideas behind offering Simple Scripts is to provide quicker access to the latest? I hope so. Actually, I am not reasonably comfortable with FTP. Everyone I ask says it’s easy, all the FTp sites I go to say the same thing but no one has actually taken a newbie through it step-by-step. I have learned a few new pointers from your write-up here, but what do I enter into the box on my desktop that asks for Administrator’s password? Is my Control Panel password. A FileZilla password? Everything is taken for granted. I just deleted FileZilla after finding out that there really are no instructions but if I want to pay for support then its maker is happy to supply me with that: ain’t that nice! There ain’t no free lunch! Brian, I agree that using FTP for the first time can be confusing. When you signed up for web hosting, the company should have given you a user name and password which you use to gain access to the control panel that controls many aspects of your account. They may have also give you an FTP path based off your domain like ‘ftp.yourdomain.com’. Typically, the user name and password you use for the control panel should also work for FTP. When you launch FileZilla type the name of your FTP into the box labeled HOST. Then put in your username and password and click the QuickConnect button. Doing this will take you to the root of your account. You should see a number of directories and files if your login was successful. If the website runs Apache web server you’ll be looking for a directory called ‘public_html”.